I don't know about you, but after Christmas and Thanksgiving I always have cranberries left over. Maybe it's because when I make turkey I never use the whole bag and stash the rest in my fridge, or I buy more than I need and days later find them sitting in the crisper forlornly. Honestly, I was never much of a cranberry fan, whether it was in the sauce that you make to top your turkey or in muffins. You see, I have a sweet tooth and I find them a bit sour. 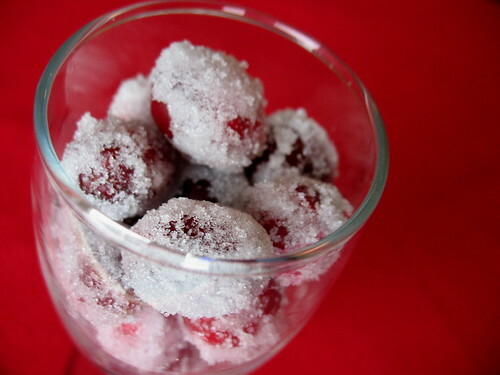 Until, of course, a friend of mine gifted me with some of these sugared cranberries last Christmas. They sat on the counter in a bowl and unable to resist their bright red, yet sparkly exterior, I nibbled at them one by one (okay, possibly it was more like handfuls) until they were gone. This year, I couldn't resist making some more and even bought extra cranberries! In a saucepan over medium heat, make a simple syrup by combining the sugar and water over medium heat until the sugar melts and the mixture comes to a simmer. Remove from the heat and allow to cool to room temperature. This is important-if you add the cranberries when it's still hot, they will burst. Combine the simple syrup and cranberries in a jar/bowl/glass measuring cup. Cover with plastic wrap and put in the fridge to chill until the next day. I have been known to forget about these and leave them 2 days, which didn't make a differences, really. Drain the cranberries. If you want to make more, you can actually save the simple syrup and use it again. In a large bowl, toss the berries with sugar, spoonful by spoonful. You don't want the sugar to clump up from the moisture, but rather coat the berries well. When they seem sufficiently sugared, spread on a parchment or waxed paper lined baking sheet and let them dry for about two hours. You can, if you wish, toss them with sugar again to take care of any missed spots, but I don't really bother. Let them dry well. I store these on the counter in an airtight container. They will last a few days, and then will start to become soft so it's best that you eat them fairly soon after making-as IF you'll be able to resist!